Are you looking for an affordable way to bring more customers to your business? Our inflatable tube man products are the perfect solution. Feather Flag Nation offers nationwide advertising solutions designed to attract attention without costing a fortune. Advertising air dancers are bright, dynamic, and direct attention to your company’s front door. Custom air dancers are also great for upcoming events. 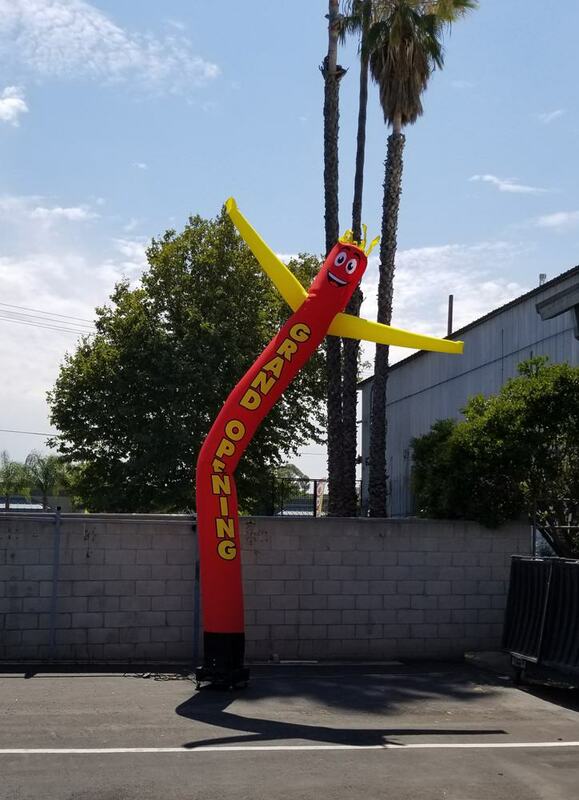 When you order an inflatable man through Feather Flag Nation, you’re guaranteed quality materials and same-day shipping when ordered before noon. We have a wide selection of fun designs and will even work with you to customize your inflatable man. Did you know that a custom air dancer will pay for itself in just a matter of days? That’s right! It doesn’t take long for companies to start reaping the financial rewards. When placed in just the right location, inflatable air dancers help your company stand out from its competitors. All our air dancer products are made from high-quality material that is most commonly used to manufacture punching bags. While many companies use nylon, we know that nylon is an inferior material. It is easily damaged and will not stand up to the natural movement of the product or the weather elements. Don’t be deceived by a too-good-to-be-true price. Cheap products are made from cheap materials. When you do business with Feather Flag Nation, you can purchase with peace of mind knowing that you’re getting a great price for outstanding construction. For fast shipping, order today! Feather Flag Nation accepts online orders around the clock. We offer secure payment methods and superior customer support. It can be hard to reach customers. That’s why we stand behind products that have been proven effective in a saturated marketplace. When air dancers are used in combination with other advertising methods, your company increases its chances of improving sales and retaining customers. Need other advertising products? That’s no problem. Learn more about our custom flags, banners, vinyl signs, and more. Don’t wait another minute to start increasing your company’s sales. Give us a call today or submit your order online. Our customer support team is available around the clock to answer all your questions about ordering, design, and payment. Feather Flag Nation is an industry-leader for budget-friendly, customized advertising solutions. Our number one goal is to help companies of all sizes and types to gain exposure in a saturated market. Call us today to learn more about our air dancer inflatable tube man products.